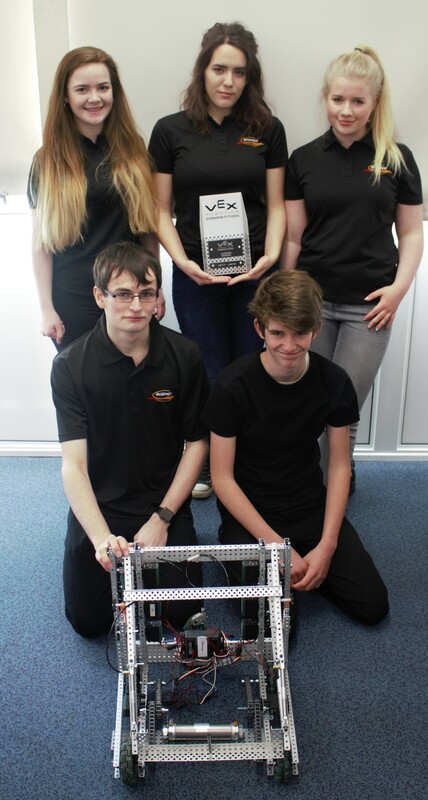 With two years’ experience behind them, our VEX robotics team were confident this year. The girls – Ellie, Leah and Juliet – have worked in their free lessons and after school to build and perfect a robot that would be able to lift 2kg cones and place them onto a “target” pole. For extra marks, the robot had to drag/push the 2kg base cones into allocated zones around the play area. The week before the competition was manic with lots of last minute adjustments and then … disaster! The microprocessor which runs the robot stopped working! The program that the team had written was useless without it, and there would not be any point in attending the Regionals. Hurried emails to VEX proved fruitless and it was only through contacts in other schools that we managed to locate a spare microprocessor at a school in Exeter. And so it was that early on Monday 29th January, in the cold and dark, we loaded up the College minibus with several large boxes of kit, the robot carefully stored so as not to be damaged and all the tools that you could imagine. We drove to Exeter and picked up the spare microprocessor and then on to Colyton Grammar School for the finals, at which thirteen teams were competing. The competition was judged by three STEM ambassadors from Plymouth and a retired businessman from the East Devon Chamber of Commerce. During the heats, we had the opportunity to suss out the competition and realised that our main threat would come from the Colyton Grammar School teams (of which there were three!) and the Wellington School team. We managed to work our way up to fifth in the heats and then it was the real thing – the final. Despite a valiant effort, during which the Bodmin College robot managed to pick up and place more cones than any other team, we could not beat Colyton. With their heavier robot, they managed to drag all of their cones into the bonus areas, thus inflating their marks. Overall we came third which was a fantastic result, beating ten other teams and also won the Judges Award which was awarded to the team with the best overall robot design, best teamwork and most successful robot.